…get a selfie with one of these little guys. To be honest, I wasn’t sure what it was either until fairly recently. A quokka is a marsupial about the size of a domestic cat, native only to Western Australia, specifically on an island off the coast of Perth called Rottnest Island. They look like gophers except they hop on their hind legs similar to kangaroos and have long, thin tails. They are popularly known to be smiling especially while chewing on leaves. You see? Food is the one constant thing in life that makes everyone, even furry little quokkas happy. 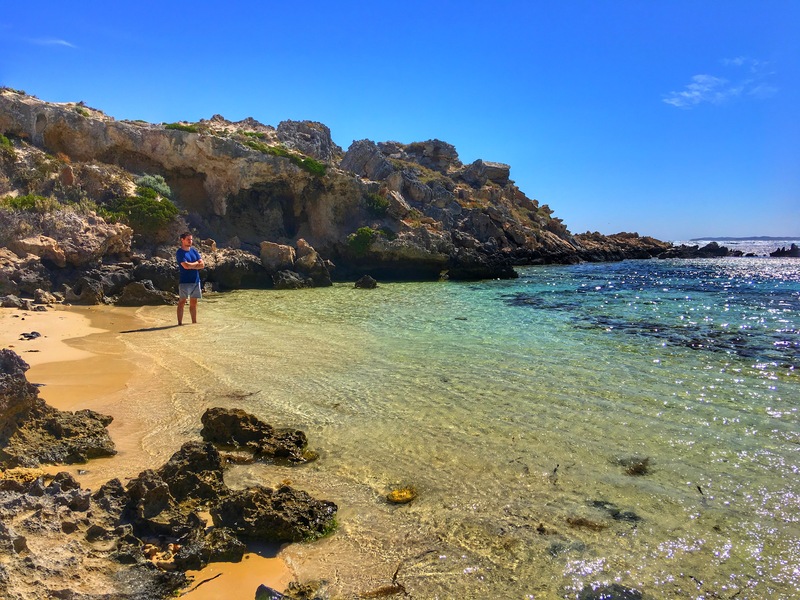 Rottnest Island is an island situated off the coast of Western Australia just a few kilometers west of Fremantle, an area neighboring Perth. Fremantle is just 30 minutes drive from Western Australia’s most populous city, Perth. This is where my friend Luke comes into play. I met him while teaching English in Guatemala in January 2015. Together, we backpacked down Central America, making notable stops in El Salvador and Nicaragua, eventually down to Costa Rica where we parted ways. Luke would be the last Aussie friend I would see during this Australia portion of the quest. Fortunately for me, he lived conveniently close to the port which ferries people over to Rottnest Island. One of the lighthouses on Rottnest Island. By the way, Rottnest gets it’s name from early Dutch explorers who thought the quokkas they spotted were giant rats. Thus the name Rattenest (Rat’s Nest) was given. It was modified to Rottsnest when it was realized that quokkas are in fact not rats at all. Luke booked us a ferry on a Tuesday. Tuesday’s are usually discounted priced return tickets to Rottnest. We also hired bikes for the island in advance. If you ever go to Rottnest, bring your own bike or hire one in advance. The island is small enough to loop the entire island during a majority of the day. It really is the most economical and most convenient means of getting around while you’re there. I assumed we would have to go deep into the center of the island to find a quokka, but they were actually spotted easier in the areas with more people. We spotted a few scouring near garbage bins and huddled under trees. They were on board. Luke wanted a selfie just as much as I did. As a matter of fact, taking selfies with quokkas only recently became a thing just a few years ago. As many times as Luke and his friend have been to Rottnest, it wasn’t a thing they thought they would do until I arrived with the plan. Getting a quokka selfie was easier to get than I originally thought. They aren’t afraid of humans at all and will come up to you as long as you have leaves in your hand for them to eat. Again, LEAVES, not human food. It’s illegal to give them human food and could get them sick. The leaves the quokka’s wanted were hanging just above their heads beyond their little reach. Daniel here to the rescue! After playing and feeding the quokkas for a while, I discovered that the famous ‘smile’ occured more often while they were chewing on fresh crunchy green leaves. Not the brown and yellow leaves that already fell on the ground. …and decided to stop eating for one second to pose for me! I rarely use the word “adorable” as part of my vocabulary but these guys were absolutely super adorable whenever they smiled, chomping on their little tree leaves with their little paws. The way they hopped over to me, when they saw leaves in my hand added to the cuteness overload. Honestly, I could have stayed there all day just hanging out with them. My plan for coming to Rottnest was already complete. I was happy and content, but as the day went by, I was made an even happier man when Luke pointed out that this island had some really cool beaches to visit. I’ve been to many beaches over my travels, so I will admit, I am a tad difficult to impress in that regards. However, the first beach we rode our bikes to, The Basin, easily made its way into one of the sweetest beaches I’ve ever been to. The Basin was not an ordinary sandy beach. Yes, it had the sand and the ocean tide, but it was more of a lagoon paradise than just a beach. The sand gently transformed into a smooth stone shelf that hedged into a natural pool of a topaz blue. Stepping into the cool water was like dipping into the cove of a private five-star resort. The lagoon extended into coral, dark marine flora, and small marine life perfectly suited for snorkeling. Just look at how clear and blue this water is! If the day couldn’t have gotten any better, an Aussie girl who was swimming near me offered me her snorkel gear. She had a bit of a fear of snorkeling towards deep waters. I gladly accepted her offer and snorkeled my way around the Basin. Even without flippers, I floated like a buoy the whole way on the surface. The Aussie girl told us that there were even better beaches on the opposite side of the island, even better for snorkeling. It’s a bit of a bike ride away but totally worth it. We had the time and if that beach was anywhere near as great as this one, I HAD to see it. We donned our helmets and rode our bikes to the southern coast of the island! The bike ride was enjoyably scenic but it wasn’t the easiest ride. The paved road was hilly which turned our holiday cycle into a slightly strenuous workout. I could feel it in my calves! But it felt good. Along the way as we cycled through Rottnest’s south coast, we were rewarded with magnificent views of the bay from a high elevation. Just like the mainland of Australia, the air in Rottnest felt dry. We approached signs warning us to stay out of the vegetation because of the venomous snakes that habitat the area. Still the weather was perfect and the island’s landscape proved to be strikingly impressive everywhere we looked. The beach we were searching for, Salmon Bay, was just in reach and it was just as cool as the Aussie girl described. Salmon Bay is a lot bigger than the Basin, and the water felt a little colder. May have just been the time of day. There was visibly more coral and fish here than the north part of the island we visited. If I’d known Rottnest was full of prime snorkeling spots, I would have bought snorkel gear just for this portion of the trip! We biked back towards the north coast and returned to the Basin. Along the way I stopped and hung out with a few more quokkas. A quokka should be beloved as much as the spotlight hogging kangaroo and koala, as the iconic animals of Australia, but oddly they aren’t. But maybe it’s a good thing otherwise the small island would be overrun of tourists. 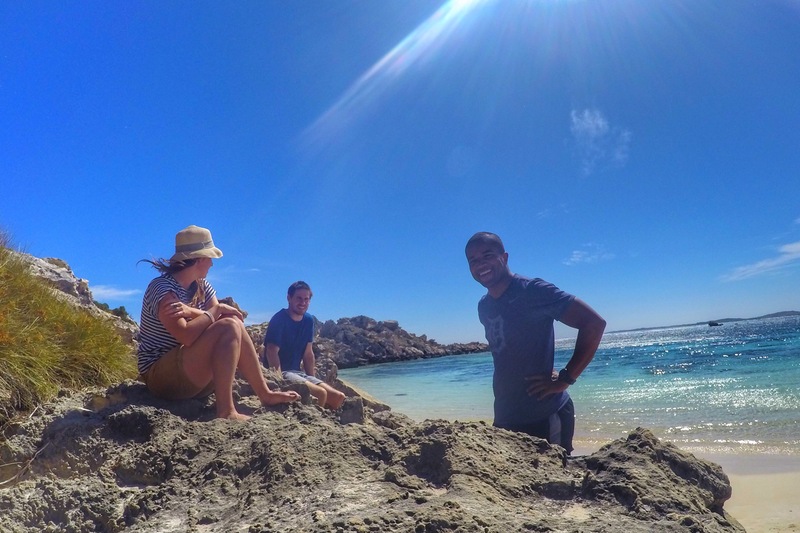 Rottnest Island was a genuine surprise for me. I knew about the quokkas, but those beaches and that bike ride were the sprinkles and the cherry to an already delicious dessert. This was also the perfect end cap to a perfect trip in Australia. We returned to Perth where I hung out with Luke for the remainder of the week. Thanks for having me Luke!